In the minds of most humans, wintertime is considered nap time for grizzly bears. With all that time spent sleeping, you'd think that a grizzly wouldn't need to take a break at all during the rest of the year. But grizzly bears' body clocks are set in sync with the seasons. The day's length, weather and food availability tell a grizzly when it's time to sleep. You're probably familiar with the cartoon images of bears snuggled up in their caves sleeping the winter away, but what about during the spring, summer and early fall months before they settle in for a long winter's nap? During the spring time, grizzly bears are active pretty much all hours of the day and night. That's because they've just become active again after being dormant much of the winter and need to find food to replenish their bodies. As spring turns to summer and the days grow warmer, grizzlies tend to take it easy during most of the daylight hours, napping and reserving their activity for the evening and nighttime. When autumn approaches and the days grow shorter and colder, grizzly bears kick their bulking up into high gear, spending more and more time each day finding and eating food. As winter draws near, grizzlies need to eat about 84,000 calories each day to build up enough of a fat store to get them through the winter. This means allocating the majority of their time -- up to 20 hours every day -- eating and leaving little time for sleep. Autumn is the signal for grizzlies to start preparing for winter, and depending on the climate, most grizzlies are well-fed and holed up for a long winter's nap by September or October. 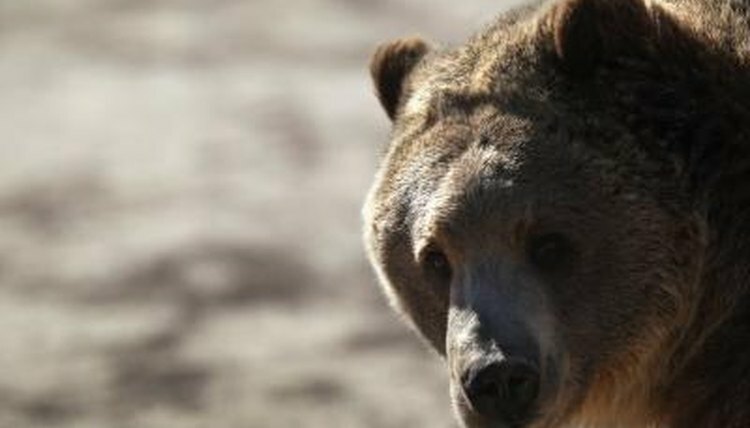 The climate and location where grizzly bears den determines how long they'll remain dormant over the winter. In the book "Land Mammals of Oregon," B.J. Vertis and Leslie N. Carraway estimate that grizzlies are dormant for three to seven months of the year, while Yellowstone National Park reports that the "denning" period for their grizzly bears averages about five months. It's almost automatic to think of bears as animals who hibernate, and while it's true that grizzlies do spend almost half of their lives sleeping the winters away, they aren't considered true hibernators. True hibernators are animals like woodchucks whose body temperatures plunge to about half of the normal level and they fall into a deeply dormant state, one from which they cannot be aroused. Grizzly bears, on the other hand, only lose about 12 degrees from their body temperature during dormant times and are easily wakened by unsuspecting visitors to their dens. In his book on grizzly bears Gary Turbak writes that some grizzlies wake periodically for a mid-winter snack or forgo hibernation altogether if food supplies are plentiful enough. How Thick Is a Grizzly Bear's Body Fat? What Adaptations Make a Grizzly Bear Unique? How Does Hibernation Affect Chipmunks Physically? Do Bears Hibernate in Captivity?